2000 | Executive Producer -- This dark drama of a 350 pound woman's last day of life is written and directed by Q. Allan Brocka. Allan, currently well known for his hit LOGO series (Rick and Steve, The Happiest Gay Couple In All The World) created and directed Roberta Loved in 2000. His unique thesis film earned numerous awards and screened at several dozen film festivals around the Globe. 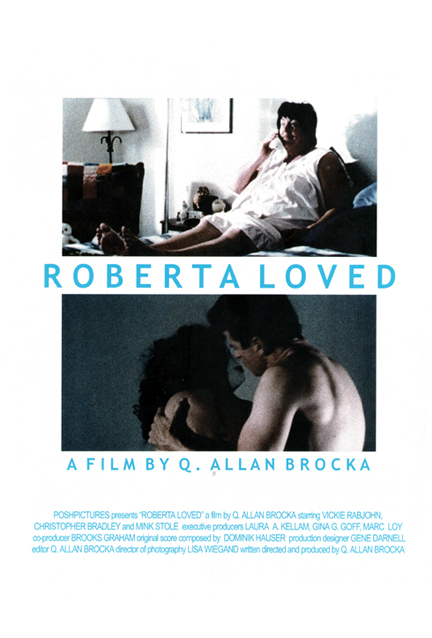 Most notably, Roberta Loved earned the Audience Award for Best Short Film at the 2003 Fairy Tales Calgary Gay and Lesbian Film Festival in Canada. This very original and moving film received North American distribution by Frameline. To purchase or rent, go to Frameline. Principal cast: Vickie Rabjohn, Christopher Bradley and Mink Stole. A powerful film that manages to evoke more grounded emotion in 25 minutes than most movies can accomplish in 2 hours. A rich, rewarding work that indicates the emerging of a unique filmmaking talent - please take note. Roberta Loved is unconventional, disturbing and wonderful. We were all impressed by the simplicity of means the subject of sexuality and disability was powerfully portrayed. The film was both honest and deeply moving. Roberta Loved is a small masterpiece.